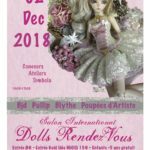 The International Dolls Rendez-Vous Show is a BJD (ball jointed doll) Event but it will also bring together all passionate of Artist dolls, Pullips, Blythes … You will also find accessories, clothing, furniture, material to create your dolls, etc. Internationally renowned artists (sewing, make-up and sculpture), professional distributors as well as passionate and fascinating amateurs-creators from Europe and other continents will be present to make this event an unforgettable day for our visitors. • A Cosplay Contest with a gift donated from one of our generous partners for the grand prize winner. • Raffle for the public with great prizes to be won. We invite you to visit the corresponding page for more information. 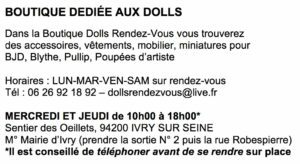 Do not miss the opportunity to meet and to share your experiences with other dolls loving people. We look forward to seeing you all on 2 December !